Healthy air quality indoors can reduce allergies and asthma symptoms. We’ll help make your home more comfortable and your indoor air cleaner. We are a local company serving Ellabell, GA and the surrounding areas- So we know what its like at certain times during the year. FACT: Air pollution is a serious problem — especially inside your home! The EPA has named indoor air pollution as one of the top 5 environmental risks to public health. Need help with your air conditioning or furnace system? Look no further. The Air Conditioning Repair & Furnace Repair Experts at Climate Systems Heating & Air are here to help you today. We have the training and experience necessary to handle all sorts of heating and air conditioning issues for all brands of heating and air equipment. We’re not limited to repairs either. Our HVAC technicians can help you with service, maintenance, replacement or installation of heating and air conditioning equipment for your home or office. 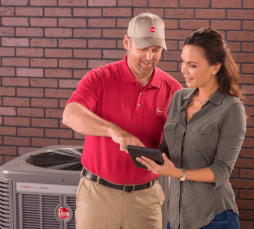 Our team at Climate Systems Heating & Air is dedicated to providing our customers with the highest quality service, parts and equipment possible at reasonable prices. We look forward to adding you to our growing list of satisfied customers. Climate Systems Heating & Air is proud to serve our local community. We can be reached by phone at (912) 659-7751 or through the contact form here on our website.